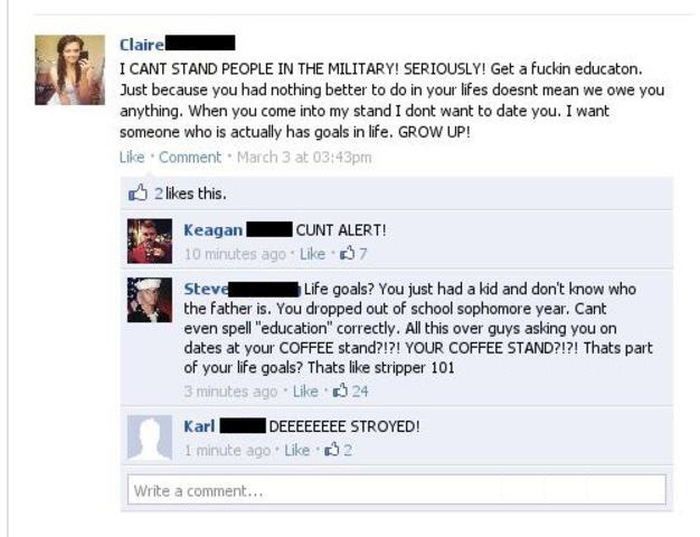 If you want to talk trash about the military on Facebook, you better be ready for the backlash. If the US did not have a military, you would be begging for one. There is a big difference between having a military and using it to invade countries. Im from Ireland, and we have a military. The navy patrols the seas for illegal fishing and drug smuggling, and the army goes on UN peacekeeping missions. And they often go to places you invaded ages ago where the nation still hasnt recovered. Infact, that is the role of most of the militaries in the world.... only very few of them still use them to declare wars.